This 30-inch Window/Deck Planter with Coco Liner in Black has flattened metal bars which make up the entire motif of the product and give the basket a very clasic, sturdy look and feel. The included coco liner prevents soil from spilling out, and the large 29 Inches long planting area offers plenty of room for flowers and vines. Included is mounting hardware which allows for easy installation. 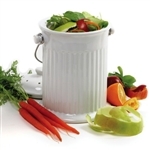 This White Ceramic Compost Keeper/Bin with Odor Preventing Charcoal Filter can store peelings, egg shells, coffee grounds and vegetable scraps for transfer to your garden composter. 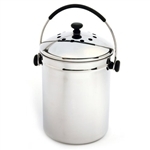 Includes charcoal free filter in lid to keep compost odorless. Is available in white, as shown, and red. Measures 10.5 inches x 8 inches, width x diameter. Use replacement charcoal free filter 93F. 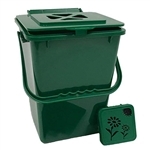 With this Fresh Air Kitchen Compost Collector Composting Bin you can say goodbye to garbagey smell. See ya later, fruit flies. Say hello to the Fresh Air compost collector. Unlike sealed containers, the Fresh Air allows oxygen to easily flow through your organic kitchen waste, allowing for aerobic breakdown. This means that food decomposes more slowly and stays drier during the composting process. The result? Less mess, less odor and no flies. This 100 Gallon Compost Sack for Home Composting - Portable Composter is portable and fits inside an average shoe box. Easy to Use Set-up takes under 1 minute. This 3-Ft High Metal Tube Plant Vine Trellis Great for Mailbox and Down Spouts is an ideal plant support for use around mailbox posts, deck supports or down spouts. Use one on top of the other to hide ugly down/drain pipes or back to back around saplings, shrubs or small trees. Get the look of classic terra cotta pots without the mess and heartbreak that comes when you break one. This 12-inch Diameter Round Planter in Weathered Stone Finish Poly Resin constructed of durable poly resin plastic that is extremely sturdy and lightweight. They won't fade, crack, split, or warp and have a thick rim and classic shape perfect for nearly any plant or small tree. Designed to work for indoor or outdoor plants, these planters are available in your choice of size and color options and even come complete with pre-drilled drainage holes. Get the look of classic terra cotta pots without the mess and heartbreak that comes when you break one. This Weathered Terracotta 12-inch Diameter Round Planter in Poly Resin constructed of durable poly resin plastic that is extremely sturdy and lightweight. They won't fade, crack, split, or warp and have a thick rim and classic shape perfect for nearly any plant or small tree. Designed to work for indoor or outdoor plants, these planters are available in your choice of size and color options and even come complete with pre-drilled drainage holes. This 1.25 Cubic Foot Rectangular Garden Planter in Desert Clay Resin - Made in USA provides an extra-large, sturdy deck box - perfect to add color to the deck or patio. Stronger than typical planters, the thick walls will not bend when planted. The planter includes a plug for easy drainage. This Sage Green Rectangular Garden Deck Patio Planter - Holds up to 150 lbs provides an extra-large, sturdy deck box - perfect to add color to the deck or patio. Stronger than typical planters, the thick walls will not bend when planted. The planter includes a plug for easy drainage. This Lightweight Durable Plastic Resin Rectangular Garden Planter in White provides an extra-large, sturdy deck box - perfect to add color to the deck or patio. Stronger than typical planters, the thick walls will not bend when planted. The planter includes a plug for easy drainage. Place the charming 6.25 Ft Wall Trellis in White Vinyl - Made in USA against your fence or your home and watch the vines make their way to the top. Constructed of maintenance-free vinyl, this trellis will never warp, rot, crack, or fade. When it's dirty, just spray it down with the garden hose. Features decorative side posts and 14-inch ground anchors for a secure mounting. This 3-Pack of Tomato Plant Cage Climbing Fruit Veggie Garden Trellis has been designed specifically for growing tomato plants and other climbing fruits and vegetables. Each cage is comprised of three 5' heavy-duty Sturdy Stakes and nine fully-adjustable support clips for continuous support throughout the plant's growth. The stakes of this cage have a strong steel core and tough, thick plastic coating. This three pack is great for any garden. Get the look of classic terra cotta pots without the mess and heartbreak that comes when you break one. This 12-inch Diameter Round Planter in Rust color Weather Resistant Poly Resin Plastic constructed of durable poly resin plastic that is extremely sturdy and lightweight. They won't fade, crack, split, or warp and have a thick rim and classic shape perfect for nearly any plant or small tree. Designed to work for indoor or outdoor plants, these planters are available in your choice of size and color options and even come complete with pre-drilled drainage holes. Simply place the rain barrel beneath a down spout to capture natural rain water. Zippered mesh cover allows water to collect while blocking leaves and debris. Connect a hose to the tap on the bottom or scoop from the top with a watering can. And if you're looking for the best deal for the planet, be sure to get our portable barrel. The ground anchor provides a strong method for securely anchoring greenhouses, dog kennels/runs, RoundTop garages, and even newly planted trees! This can quickly anchor anything without digging to help prevent wind damage and theft. This Set of 3 - 36-inch Fan Style Raised Garden Bed or Pot Trellis in Green spreads outward from a narrow base as it extends upward to a height of 36 Inches . Perfect for small climbing plants and use within a pot of 5 Inches diameter or more. This Solid Fir Wood 2 ft x 2 ft Raised Garden Bed Planter is a perfect addition to your garden. This garden bed is perfect for growing your plants and vegetables. The 24" length and 24" width of the bed will give you ample space to place your plants and help them grow proficiently. The bed is made of 1" thick wood that is built for all year using. The small frame allows you to use this bed on your patio, lawn, or garden. Fill it up with soil (not included) and start planting your garden this season. If you are looking for such a planter, don't hesitate to buy it now! This Solid Fir Wood 3.3 ft x 3.3 ft Raised Garden Bed Planter Box is perfect for growing your plants and vegetables. The 40" x 40" garden bed offers ample space to your plants and helps them grow quickly. The garden bed is made of 0.6" thick wood that is built for all year using. The suitable frame allows you to use it on your patio, lawn, or garden. Fill it up with soil (not included) and start planting your garden this season. It is perfect for your garden. Don't hesitate to buy it now! Increase your gardening fun by adding this Outdoor Folding Garden Table Potting Bench with Slatted Bottom. Featuring a spacious workspace with pre-attached hooks for easy access tools. It provides a slatted bottom shelf that will help reduce the mess lingering solid and dirt. This Solid Wood 4 ft x 2 ft Raised Garden Bed Planter 9 inch High is perfect for growing your plants and vegetables. The 47" length and 24" width of the bed will give you ample space to place your plants and help them grow proficiently. The bed is made of 1" thick wood that is built for all year using. The small frame allows you to use this bed on your patio, lawn, or garden. Fill it up with soil (not included) and start planting your garden this season. If you are looking for a garden bed, don't hesitate to buy it now! Bring a burst of color to your garden! These 3 Piece Ceramic Planter Set in Azure Topaz and Peridot are sumptuous in shades of azure, topaz and peridot. Set includes three separate sizes to hold a variety of your favorite greenery! Drain hole at bottom of each pot. Ceramic. Large: 12 inches diameter x 8 1/2 inches high; Medium: 9 inches diameter x 6 1/2 inches high; Small: 6 1/2 inches diameter x 5 1/4 inches high. Set of 3. This Set of 3 Egyptian Alabaster Planters - Planting Pots is great for small cacti or other plants in an outdoor setting. The natural tone of these handcrafted Egyptian alabaster planting pots feature a matte finish that is a perfect accent to any garden setting. All of these oriental alabaster products are made by the same workshop and have been for the past 12 years. Our artisan is Mr. Mahmoud Abdel Nabi, who was born in the Egyptian countryside, but who moved to Cairo and grew up there from an early age. Mr. Abdel Nabi has worked in the field of marble, alabaster and stone for most of his adult life. Oriental alabaster is a translucent marble found only in Egypt. The ancient Pharaohs utilized this marble in many aspects of their daily lives and religious ceremonies. Its use in Egypt has been carried down to the present day. Of course, giving work to people is called 'opening homes,' here in Egypt. To be able to help people by giving them work, is not only a responsibility, but a pleasure. This 75-Gallon Collapsible Composting Compost Bin Composter features an easy-to-assemble, easy-to-use design that can simplify and speed the composting process. It includes a spring-loaded design that makes set-up and storage a breeze, in addition to offering easy access when it’s time to aerate your compost. An open bottom, round shape and mesh walls work together to maximize the breakdown process, yielding usable compost as efficiently as possible. A windproof lid, sturdy construction and included anchoring stakes help our Eco Bin Composter withstand the elements and years of use. This 4-Ft High Garden Trellis with Metal Birds Branch Design in Espresso adds an interesting feature to your garden wall, fence or screen. Delicate looking branches and fun little birds decorate the undulating design. Sturdy steel construction with powder-coated polyester epoxy finish. Espresso color. Perfect for long-stemmed or climbing plants such as roses, sweet peas and clematis. Measures: 48" tall x 14" wide. Beautifully designed, this Solid Wood 3-Ft x 3-Ft Raised Garden Bed Planter Box - 12-inch High is crafted from strong and durable fir wood and helps you to create a neat and organized garden. With plenty of room to mix in nutrient soil, this garden bed gives you plenty of options on placement and helps to keep weeds at bay. Plant your own salsa garden with the Solid Wood 3-Ft x 3-Ft Raised Garden Bed Planter Box - 12-inch High with cilantro, green onions and red peppers. Grass clippings, leaves, produce and organic waste are the best nutrients for your garden and flower beds. Turn them into rich compost with this Steel Metal Wire 3-ft Compost Bin in Green - Make your own Garden Soil at Home. This 4-Tier Growing Rack Planter Stand Greenhouse with Steel Frame would be a great addition to your home. It is ideal for extending your growing season and has a uv-treated plastic cover great for any climate. This Set of 3 - Half Barrel Wood Planters would be a great addition to your home. It has a rectangular shape and is constructed of wood. Bring classic architecture to your wall, fence or screen with this 60-inch Gothic Arch Top Metal Wall Trellis for Home Garden. The overlapping diamond pattern underneath the gentle arch is reminiscent of patterns found on vaulted cathedral ceilings from the Gothic period. A rectangular grid work below the decorative top creates a sturdy frame while offering several places for climbing plants to grasp as they grow and entwine. Create patterns on your trellises by training your plants to weave through the squares as they grow, for a more geometric garden. The two legs easily insert into the soil. Durable black polyester epoxy powder-coated finish. Sturdy solid round metal rod construction. Insert into a planter or use as a stand alone trellis. Use two or more together to form a screen. Measures: 60" high x 20" wide. Color: black. This Elevated 2-Ft Cedar Wood Raised Garden Bed Planter Box - Modern Triangular Shape has a simple design and a snap to use. This elevated planter keeps flowers, herbs, and vegetables easy to access. It's ideal for small spaces like patios, decks, condos, apartments, or assisted living facilities. This elevated garden bed is handicap accessible. It's available in size options and is elevated on durable X-shaped legs that prevent pets and critters from damaging your plants and seedlings. This elevated garden bed is built of a combination of unfinished, naturally rot- and insect-resistant western red cedar and eastern white pine. It's easy to assemble as it comes pre-drilled and pre-cut with all fastening hardware included. This Mobile Half Barrel Solid Wood Planter Box on Wooden Wheels is a kind garden planter. With its rustic design and antique look, you will complement your outdoor décor. The Fir wood construction and burn finish will give you the style you have been looking for in your garden. Besides, the solid Fir wood construction makes the cart sturdy and durable. Its four rolling wheels will help you move it easily. The width and long length of the wagon cart will securely hold your plants in place. Do not hesitate to buy one! This Outdoor Home Garden Wooden Potting Bench with Storage Drawer is very helpful for garden jobs. 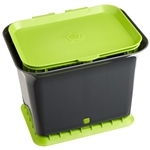 It can organize your garden tools, plants pots, fertilizers, soils, water cans, gloves, etc. Made of solid wood and metal sheet, the work station is durable and sturdy. With a hook, the work station can hang garden tools. The drawer is for storing small items. Beneath the work station, the spacious space can accommodate many potting items. This work station can satisfy your garden job, do not hesitate to buy one! This Outdoor Garden Wood Potting Bench Storage Shelf with Metal Top can be an ideal tool for a garden job, they can put in small patios, decks, condos, and apartments. Made of solid wood and metal sheet, the work station is durable and sturdy. With a hook, the work station can hang garden tools. The three shelves are provided for storing potting tools, seeds, and other tools. The feet of the work station is covered by galvanization, protecting the feet from rotten. This work station can satisfy your garden potting job, do not hesitate to buy one. This Folding Wooden Garden Workstation Potting Bench with Shelf has a solid wood construction that is sturdy and can serve you for a very long time. The planting bench has a fine design. Its top handing bar can help hold the potting, preventing it from falling onto the ground. It has 3 hooks for hanging your gardening tools. And its shelf is really useful, which provides you with enough space. You can put your potting on it. If you own this potting bench, it’s sure to be a great display in your garden. Whenever you walk into the garden, the potting bench can bring you a wonderful sight experience. So don't hesitate! Come and buy one! This Rustic Metal Urn Style Garden Planter for Indoor or Outdoor Use is for inside and outside your home. With drainage option in base. Fashionable accessory for outdoors or in. Great addition to any patio or landscape. This Black Composter 100-Gallon Compost Bin for Home Composting is a large standing compost bin. It's one of the few standing bins that requires minimal, tool-free assembly. Created using innovative Polish design, the entire unit snaps together in a matter of minutes. Once assembled, the unit can sit in a garden or in an out-of-the-way location. Simply add composting materials and let nature do the rest. Composting will take anywhere from 1-12 months depending on environmental factors and materials added. Once the compost is ready, simply spread it on the lawn, use as mulch in the garden or combine with potting soil. Your plants will grow like you've never seen before. If you want to get started with composting without a large investment, get the Black Composter 100-Gallon Compost Bin for Home Composting. This Lily Lotus Flower 100% Copper 8-Foot Rain Chain is made of pure solid copper. The chain is nicely crafted and very smooth by touching. It makes soothing sound when water travels down. Copper will last for decades and become prettier with age. The entire chain is 8-ft long and has 18 flowers (each with 8 pedals). This length is sufficient for a standard single story house. Each unit comes with an attachment piece and is very easy to be installed into your existing gutter system. The individual flower is 2 1/8" tall and measures 2 1/2" in top diameter. The bottom hole is about 7/8" in diameter. Length of the chain can be easily adjusted by adding or removing flowers. This Pure Copper 8.5-Ft Long Rain Chain with Wide Mouth Funnel Cups is 8.5 feet in length. Each rain chain consists of 20 cups, each cup measures 3.25 inches in length by 3.25 inches in width by 3 inches in height. This Pure Copper 8.5-Ft Rain Chain with 13 Hammered Funnel Shape Cups has set the standard for premium pure copper and aluminum Rain Chains as an effective means of replacing standard gutter downspouts and transporting rain water from the gutter. This Pure Copper 8.5-Ft Rain Chain with Flower Cups is 8.5 feet in length. Each rain chain consists of 24 lily cups, each cup measures 3.25 inches in length by 3.25 inches in width by 2.75 inches in height. This wooden Potting Bench is extremely practical and is great for quick gardening jobs, providing a large work surface and lower tier to use for storage. The potting bench work table is made out of Chinese Fir Wood with oil-based stain and is good for both indoor and outdoor use. This wooden 3 tires elevated the vegetable bed. This Solid Wood 4 Ft x 4 Ft Raised Garden Bed Planter 3-Tier is perfect for growing your plants and vegetables. With its step stair design, you can place various sized plants inside each level. Each section is approximately 7 inches higher than the next, giving plants ample space between each other to grow efficiently. It can not only be a beautiful decoration of your garden but also can be used as a display stand, storage rack and so on. Solid wood construction makes this vegetable can serve you for a long time. Do not miss this planting box. This Solid Wood 8 ft x 2 ft Raised Garden Bed Planter is perfect for growing your vegetables and flowers. You can put it in the garden, backyard, and lawn. The vegetable bed allows enough space for each vegetable, so they can grow efficiently. The boards are made of 0.5-inch thick Cedarwood that is built to last through the seasons. There is a divider in the middle of the box so that you can plant two different plants in it. With this planting box, you can plant any vegetables as you want, do not miss this planting box. This Black Metal Garden Potting Bench with Wheels is made from solid galvanized steel, durable and have a long lifespan. If you love to garden and plant flowers, vegetables, and herbs, this is the perfect potting bench for you. With a lower shelf, you can store your gardening tool or display more pots in your outdoor living space. What's more, it designs simple and modern, which will a great decoration for your garden. It features two handles and two wheels for easy movement, which brings a lot of conveniences. The 7.75 Ft Fan Shaped Garden Trellis with Pointed Finals in White Vinyl gives support to climbing flowers and vines, while the pointed finials add a classic touch. Climbing flowers and vines will also create just the right amount of privacy to your walkway or garden. This trellis is constructed of high-grade PVC vinyl that carries a 20-year warranty. It is durable and maintenance-free, too. UV stabilizers protect the vinyl from harmful ultraviolet rays, so it will not fade over time. As an additional bonus, this trellis will never need painting. Includes four wall-mounting brackets. This 60-inch High Metal Garden Trellis with Climbing Vine Leaf Design adds an interesting feature to your garden wall, fence or screen. Delicate looking branches and fun little birds decorate the undulating design. Sturdy steel construction with powder-coated polyester epoxy finish. Espresso color. Perfect for long-stemmed or climbing plants such as roses, sweet peas and clematis. Measures: 5' tall x 20" wide.